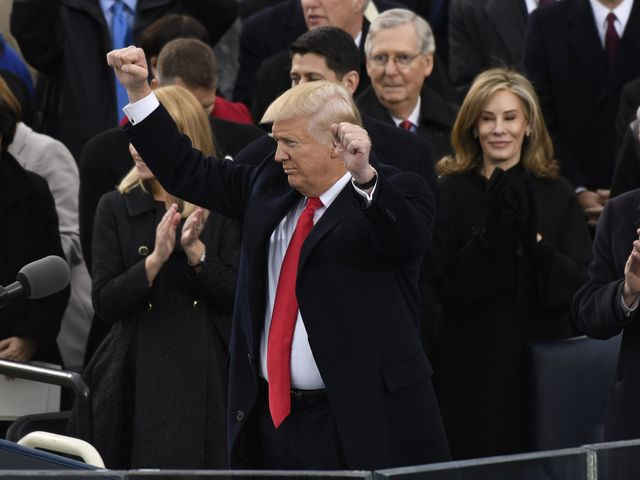 WASHINGTON — Donald Trump, assuming the mantle of 45th president of the United States on Friday, pledged an "America first" administration that would take power from do-nothing politicians and return it to "forgotten" Americans. 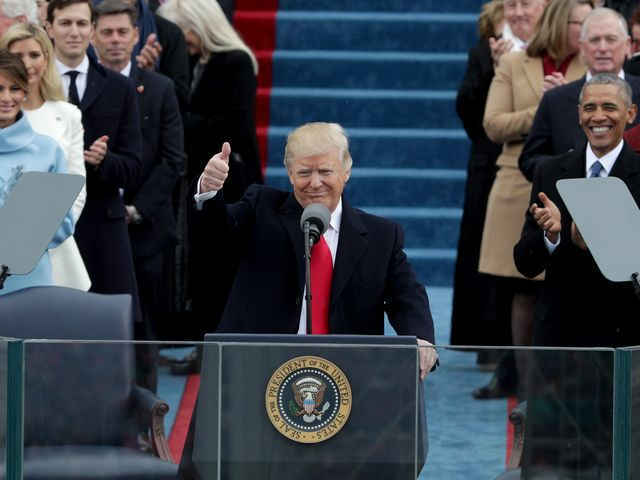 Trump, a combative New York real estate mogul who harnessed a powerful populist message for a deeply divided country in his first bid for public office, took the oath of office from Supreme Court Justice John Roberts. "The forgotten men and women of our country will be forgotten no longer," he told the crowd as a light drizzle settled over Washington. " And I will fight for you with every breath in my body, and I will never, ever let you down." 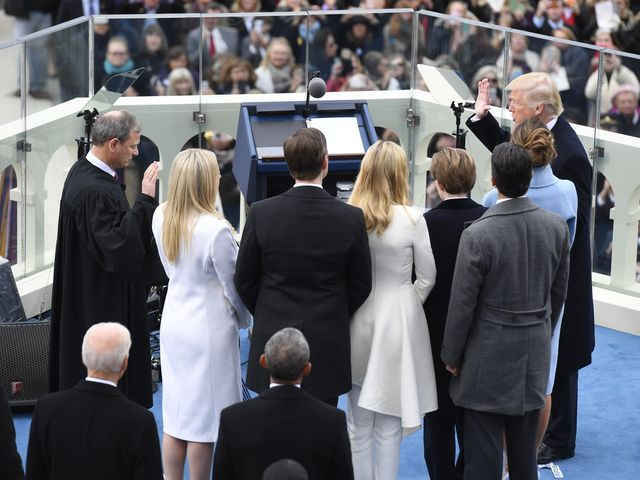 Wearing an overcoat and bright red tie and instantly recognizable by his long, swept back blond hair, Trump raised his right hand to take the oath of office, placing his left hand on two Bibles — his own, and one used by Abraham Lincoln in 1861. He then delivered a brief, but darkly-toned address to the nation and the hundreds of thousands of people gathered in front of the Capitol. He pledged to transfer power from Washington and to (give) it back to you, the people." He vowed to bring back jobs and to protect the border and drew loud applause from the by vowing to eradicate "radical islam." Trump, surrounded by the elite of Washington establishment, also promised to "no longer accept politicians who are all talk and no action, constantly complaining but never doing anything about." Less than an hour after he finished his remarks by raising a clinched fist, Trump escorted his predecessor, Barack Obama, and now former first lady Michelle Obama, to a waiting helicopter that lifted off and circled the Capitol en route to Joint Base Andrews for a flight to the warmth of Palm Springs, Calif. Earlier, Mike Pence, a former congressman and governor from Indiana, was sworn in as Vice President by Justice Clarence Thomas. The 70-year-old billionaire — and self-styled "disrupter" — was joined by his wife and children. Also on hand were three of the four living former presidents, members of the Supreme Court and leaders of Congress. In addition, his Democratic rival in the election, Hillary Clinton was in attendance, tweeting that she was there "to honor our democracy & its enduring values. I will never stop believing in our country & its future." Minor skirmishes were reported on social media as the morning wore on, including reports of pepper spray being used against protesters According to reporters in the crowds, officers were firing loud firework-type devices at protesters as they ran through the street. A short while later, the demonstrations appeared to have quieted. In a sign of the new social media world that Trump has championed, Obama also took to Twitter Friday morning in likely his last use of the @POTUS Twitter handle as president, tweeting that "It's been an honor of my life to serve you." At 10:52 a.m., as moving vans and decorators rushed to transform the Obama White House into the Trump White House, the two couples traveled by limo down Pennsylvania Avenue for the formal swearing-in ceremony that marks the end of an exhaustive and combative 19-month campaign. One protest march Friday, which organizers are calling a “Festival of Resistance,” will travel about 1.5 miles to McPherson Square, a park about three blocks from the White House, where a rally including filmmaker and liberal activist Michael Moore is planned. 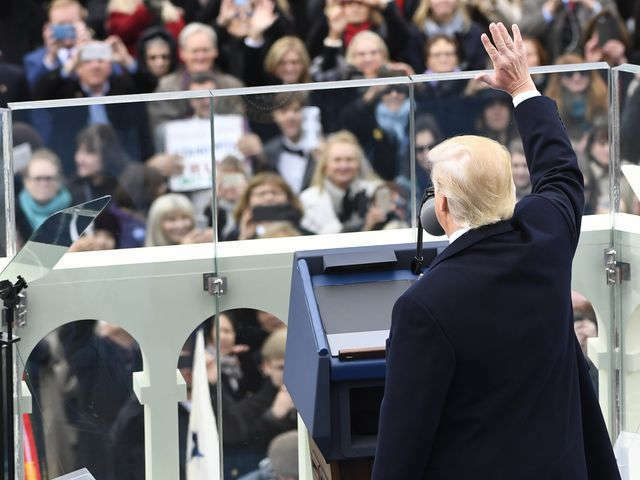 The crowd in prime seats below the podium included at least one anti-Trump protester, Erika Hoel, a 23-year-old from Seattle, Wash., who sat quietly before the ceremony began , wearing a bright pink knitted hat. The two days of ceremonies kicked off Thursday with Trump laying a wreath at Arlington National Cemetery, followed by a "Make America Great Again" concert and rally at the Lincoln Memorial featuring country singers Toby Keith and Lee Greenwood. Also performing: Jackie Evancho, The Mormon Tabernacle Choir and the Missouri State University. Celebrities such as actor Jon Voight was also in attendance. Trump addressed supporters who he called "the forgotten man and the forgotten woman," saying "you're not forgotten anymore." Although Friday marks the end of the major inaugural ceremonies, protesters plan to take the stage on Saturday with demonstrations by an expected 200,000 people, with the largest group participating in the Women's March on Washington.